The night markets Melbourne puts on during summer are great places to meet and hang out. There is local music and entertainment, food from around the world, original shopping and a great atmosphere. Night markets are a mix of entertainment, local artesian and food fairs, and market stalls. Following the successful night market at the Queen Victoria Markets Melbourne there is now also a Chinatown Market Day, as well as the Coburg and Geelong Night Markets, the Supper Market at the Abbotsford Convent and a Kris Kringle Night Market in Northcote. We have Asian night markets Melbourne, and they are on all year! 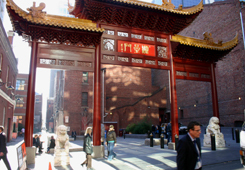 Actually, it is an afternoon and night market,every 3rd Friday of the Month, in Hefferman Lane in Chinatown, 4-10pm. Chinatown is buzzing on Friday nights. The market is packed with 'truly, madly, deeply scrumptious' food and is a good way of experiencing Chinatown, dumplings, rice, noodles, satays and cakes. It also invites you to linger and check out the eateries and Asian stores, which you may rush by at other times. This night market is on Wednesday evenings during summer, from the middle of November to the beginning of March - except during the Christmas week - at the Queen Victoria Markets. A great place to hang out and soak up the atmosphere - with over 35 food stalls, ranging from Indian, to Vietnamese, Ethiopian, Spanish, Dutch and Middle Eastern, as well as licensed bars with great wines from Victoria’s regional vineyards. 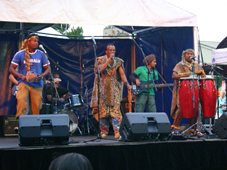 You are also treated to the best world music and live entertainment Melbourne has to offer. 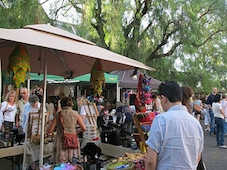 There is unique shopping – clothing, jewellery, original prints, plants, and regional food stalls with chutneys, mustards, olive oils and dried fruit. You might even get a massage or treatment from one of the therapists or alternative practitioners. The Queen Victoria Night Market is at the corner of Peel and Victoria Streets. You get there with any of the trams from the city along Elizabeth or William Street. It is a special market for the vibrant community of Melbourne clothing designers and makers, emphasising local design and collections vintage and collectible clothing, accessories and jewellery, as well as artworks and home wares. For the palate there is curb side Paella and Italian, Asian and other international food stalls, wine & beer, live music and entertainment. It is located along the street and under the verandas of South Melbourne Market. This Supper Night Market is set in the ambient historical grounds of the Abbotsford Convent - every Friday evening in December, January and February. It is a market alive with the Melbourne community spirit and a local band playing for entertainment - making it a perfect night to start off the weekend or for a picnic on the convent lawns. Market stalls include local craft products, new and vintage clothes and fair trade stalls. 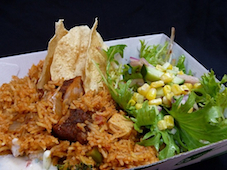 Servings from the hawker style food stalls will keep your palate and stomach happy. They include a Himalayan Sherpa stall that makes fantastic chicken biryani, prawn skewers, chicken spinach dumplings... And there is French food from Le Petit Provencal with the speciality of pissaladiere, a caramelised onion tart. The Convent is at the end of St Heliers Street, Abbotsford. You can get there with the 200, 201 and 207 buses from Lonsdale St in the city, or with any bus travelling down Johnston St. Get off at Clarke St, turn right and then left into Heliers St. You can also get there via the Yarra cycle path, or you can park your car in the adjoining car park. The market operates only if the weather is good. You can check the Suppermarket website. Bay, beach, summer breeze and night market - a great combination. It is on most Thursday nights during summer. Great place to spot locally-made arts and crafts, fashion and accessories, produce and design, right under the gaze of the Luna Park. This night market was a success in 2010 and is to continue - at Bridges Reserve, just east of Sydney Road in Coburg – for six Friday evenings from the middle of November til just before Christmas. Similar to the Night Market at the Queen Victoria Markets Melbourne, there is a mix of multi-cultural cuisine, vibrant local live music and dance performances, artisan stalls, and licensed bars.Keep your palates happy with a wide range of predominantly multi-cultural foods - all cooked fresh on-site, fully licensed bars, vibrant bands and performers, as well as children’s activities. You will find young designer fashion and artisan stalls with an eclectic mix of innovative, unusual and bizarre products. And there are health & harmony stalls - dedicated to mind, body and spirit, as well as related natural products. The Kris Kringle Night Markets are on four Thursday evenings leading up to Christmas at Northcote Town Hall. Great place to find that right Christmas present! There are over 50 stalls selling hand-made designer fashion, accessories, giftware, jewellery, ceramics, woodcrafts, home wares, plants, and other things. And there is free entertainment from some of the best local musicians, and food stalls. You get there with the 86 Tram from the city. This is an evening market held on the four Friday nights leading up to Christmans - with special treats, summer atmoshpere and market stalls offering arts, vintage, fashion, jewellery as well as other bits and piece, and Kid's entertainment. At Waterfront City, Docklands. The Geelong Night Market is on Friday evenings from the middle of January to the middle of February. It is located in Johnstone Park, Geelong. It features regional food producers, local artisans, and live entertainment, with bands and performers showcasing different genres. 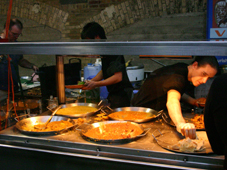 There is interesting food - both regional delights and cuisines from around the world - all cooked fresh on-site, licensed bars & wineries, and as well as children’s activities. You’ll find young designer fashion and artisan stalls with an eclectic product mix, a health & harmony area dedicated to mind, body and spirit. This night market is located on Phillip Island, a popular summer holiday spot. It is a lively, vibrant market bringing together an eclectic mix of designers, artists and craftspeople offering handmade products and designs, original art and collectables, vintage inspired fashion, accessories and home wares. There is all sorts of food - traditional and gourmet, culinary flavours from around the globe, award winning wines and music and entertainment. All in all, a great place to relax and unwind in the summer breeze in the unique island setting. The Koorie Night Market moveable feast of Aboriginal and Torres Straight Islander arts, crafts, food, music and dance.This market is based in Melbourne, but moves all around Victoria. Here is a video about the Suzuki at Queen Victoria Markets Melbourne.